Cryptocurrency Report : Are we in Bitcoin rally mode of a bear market? Where do we go from here? Optimism! Bitcoin represents 33% of the total market capitalization of all cryptocurrencies. Other cryptocurrencies tend to be highly correlated to the price of Bitcoin. So, in theory, if Bitcoin does not do well then other cryptocurrencies will not do well either. Keep this in mind when I do my analysis. The last two weeks were encouraging for Bitcoin and other cryptocurrencies as the support level of $6,000 was achieved for bitcoin yet again. This has been the fourth time the critical support level at $6,000 has been challenged. I am starting to believe that the Bitcoin floor is $6,000. The recent Bitcoin rally is a weak rally. Investors in Bitcoin are starving for a blockbuster rally that will make them believe again. Those who understand candlestick charts believe that this rally is for real. I disagree. The rally is weak and according to my metrics has not convinced me at all that it will last. For example, we can take a look at the two prior rallies to see how Bitcoin went from around $6,000 to around $8,000. Swing traders, if they did this right, could have captured almost $2,000 per Bitcoin. That is a lot of money. That is about a 33% gain per rally. These two rallies had above 10% gains to start along with a follow through gain while coming off of support at around $6,000. So why do I believe that the current rally is weak? If you look at the rally below you will see the velocity or speed of the increase is not the same as the other rallies. The rally just does not have a strong force to it. When a rally starts in Bitcoin you want to see price and volume action that is heavy on the buy side. Here, in this snapshot, it is not happening. 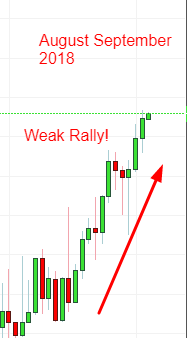 What would convince me that this rally is for real? It would convince me that this rally is for real if Bitcoin surges to $7,500 in the next few days. Other than this I am just sitting on the sidelines in my trading portfolio. Just like some investment companies I have a trading portfolio and a long-term portfolio. In my long-term portfolio I dollar cost average Bitcoin and other cryptocurriencies. I believe that a portion of my overall investment portfolio should be in cryptocurrencies because this crypto market is giving above average returns. In my trading portfolio I try to take advantage of swings in Bitcoin and other currencies when I can. Having trading money separate from your overall portfolio is a good strategy since it separates your investment goals away from each other. This strategy also keeps you focused on what is best for each portfolio. Dash last week had an upsurge of almost 50%. Looking at this cryptocurrency alone I would have bought it in anticipation of a rally. But I know from experience that I must review the overall market before I make a critical investment decision. Today’s action (September 2, 2018) was not good for both Dash and Bitcoin. Dash had a bearish reversal and Bitcoin’s run to the upside was weak overall. For now, I will stay on the sidelines in my trading portfolio and wait for a better signal. Dash’s action today definitely showed that Dash’s chances of a robust rally is not going to happen. Right now, the cryptocurrency market is in a bear market. People are having a hard time putting money in Bitcoin when Bitcoin almost crossed $20,000 per unit in December 2017. Right now, the price of $7,200 makes those who held the coin at over $19,000 feel like they made a mistake holding it. Miners are not mining because they believe that it is useless to mine when the market had such wild fluctuations. In reality, Bitcoin along with other coins are far from over. Bitcoin has had large upswings in their history followed by an over 70% decrease. This is normal action for Bitcoin. This has happened in its history two too many times. The future for Bitcoin is bright. This is why. • Bitcoin is becoming more popular despite the bear market. • Bitcoin is gaining more merchants that want to use the blockchain to complete transactions. • Miners are still mining Bitcoin at a profit. The talk show hosts, pundits, and the side line railers will all talk about how the Bitcoin bubble has popped. They do this because they want to be “cool” and in with the crowd. Do you notice that talk show hosts and T.V. personalities never give you the reason why they believe in something? This is because they want to look “hip” or “cool” and go along with what everyone else is doing. I bet you that 99% of those who owned Bitcoin did not get out near the top of the rally and suffered as they watched their investment go below five digits. Do not listen to the crowd. Make your own decision based on fundamental and foundational principles that have been tested through time. Listening to railers and side show hustlers on T.V. is not going to make you a better investor. There is no such thing as crowd investing. Everyone, in the end, has to make their own decision. Get educated on Bitcoin and learn why we are here in the first place. A lot of you only own Steem and there is nothing wrong with that. However, you should expose yourself to Bitcoin and other cryptocurrencies out there. I believe that Steem some day will be a top coin but it is not the only coin out there. You should expose yourself to other coins. You do not have to buy them but the experience will make you understand why you invest in certain cryptos. Bitcoin and other cryptocurrencies are potentially a rocket ship that could blast you into new heights because of supply and demand. Today, you and I are investors in the U.S. Dollar. The U.S. dollar continues to be printed by the Federal Government in massive quantities. This money is literally handed out to wealthy persons in the form of easy money loans, low interest rates, investment loans, and construction project loans. They believe that the easy money policy will, in some way, trickle down the economic chain to the ordinary person. You work hard and slave over your boss’ projects while your money is devalued due to printing money inflation. It is time to fight back. You can fight back by using the cryptocurrency blockchain to rid the corrupt fat cat banking system that we are all a part of. The corrupt fat cat banking system wants your money in so many ways. They charge high fees for loan applications, overdrafts, and just for processing easy things. They even will hold your money just to make more money on the float. Instead help merchants save money by purchasing in Bitcoin or other cryptocurrencies and eliminate the middleman. 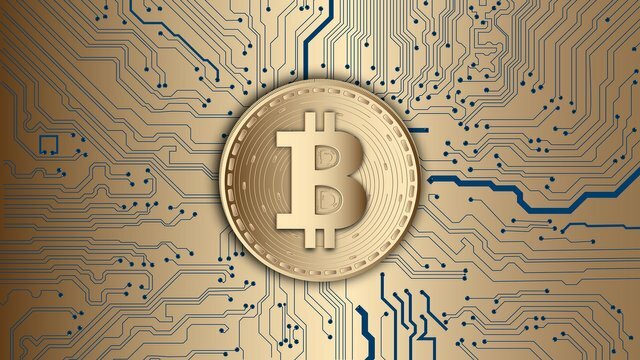 Now is the beginning of a great future for Bitcoin and Steem because there is so much upside potential. Several years ago there were no Bitcoin ATMs. Now there are. Several years ago, blog posts from websites were the only monetizable avenue for a creator. Now you can share your content and get immediate monetizable feedback. More people are becoming aware of the benefits of the block chain. You should be happy of the endless possibilities that are becoming available. Hi @johnkumar, I'm @checky ! While checking the mentions made in this post I noticed that @jb25367ii doesn't exist on Steem. Maybe you made a typo ?